The Shali Tibba is a peak that is hard to miss. It towers over the district of Shimla, right behind the Mashobra ridge. Despite its conspicuousness, however, the peak does not attract as much attention as it deserves. Shali Tibba, at an altitude of 9,423 feet, is surrounded by Shimla, Mashobra, Kufri, Fagu and Narkanda. This stand-alone peak provides a magnificent vantage point for a panoramic 360 degree view of Himachal Pradesh. The road leading to the base camp, Khatnol Village, winds through a quiet and beautiful valley of blue pine and cedar forest. 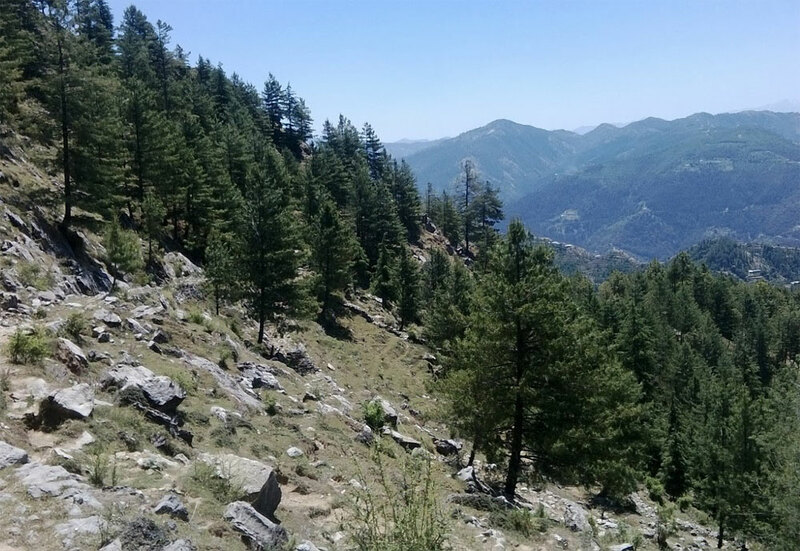 Away from the hustle of Shimla, the trek to Shali Top is beautiful, short and easy and can be completed in a single day. It is an ideal weekend trek in Shimla. The Shali top has a temple dedicated to Bhima Kali, a goddess, who is highly revered by locals. Devotees flock to the top regularly, especially during Navratri. The temple has been constructed with wood and stones, typical of rural Himalayan architecture. A trail to the temple was constructed in 1936 by the Raja of Faridkot. The same trail exists today and is in a good shape. SHIMLA TO Khatnol. It took us 2 hours to reach Khatnol. Around 300 metres before Khatnol, you will see a road going up the mountain ridge. You will also see a sign board stating the way to Bhim-Kali Mandir – Shali Tibba. This is a kuchcha but motorable road going up the ridge, leading to Shali Tibba. The road allows a vehicle up for another 2 km, after which there is a dead-end and just enough place to reverse the vehicle. The trek can start from this sign board or after 2 km. The road winds through the ridge and goes along a forested area. In the backdrop, Shali Tibba main peak dominated the view, with Chota Shali Tibba on its left. The trail zig-zags upwards, with a series of scissor bends. Approx. 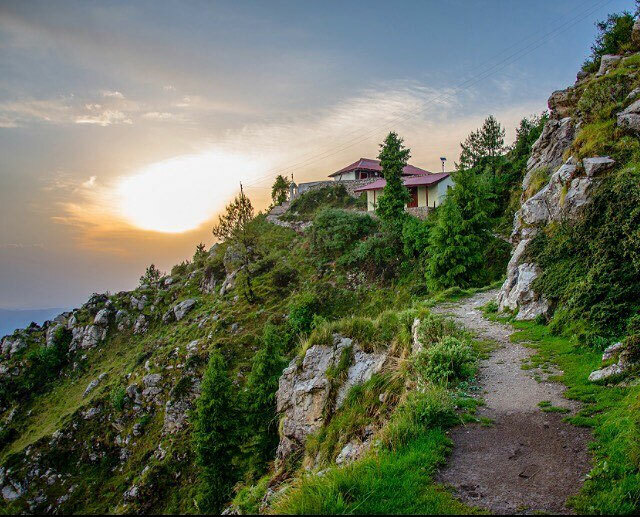 3-4hours journey of hike straight up the mountain will have you reach the destination. Finally You reach the gate of the Shali Temple, which has an old bell hung on it. Proceed straight up on cemented stairs till the point you reach a small level land. Here, there are two cemented huts meant for pilgrims to spend the night.